Wicher CD32 is the Amiga CD32-compatible memory card providing up to 11.5 MB FAST RAM, a 2,5" IDE hard drive interface, and a Clockport connector allowing further expansion with additional peripheral devices. 8MB 72pin SIMM modules are available as option. 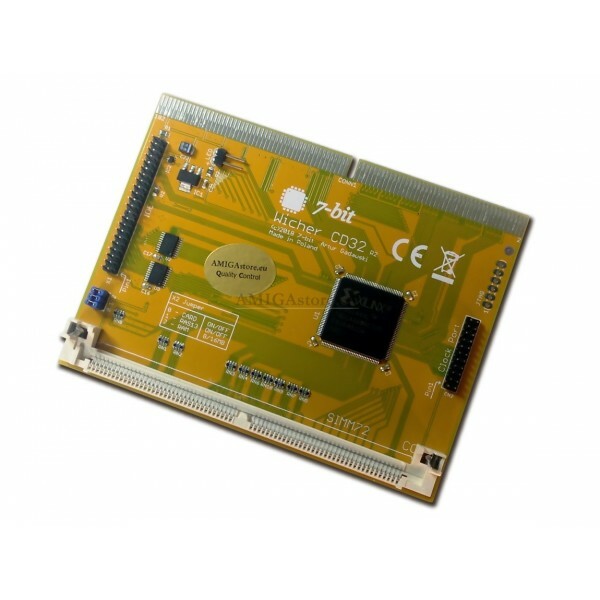 Wicher CD32 is the Amiga CD32-compatible memory card providing up to 11.5 MB FAST RAM, a 2,5" IDE hard drive interface, and a Clockport connector allowing further expansion with additional peripheral devices. 8MB 72pin SIMM module is available as option. • RAM expansion: standard SIMM72 (FPM/EDO) 1-8MB, 60ns memory module (not included, available as option). • ClockPort connector for additional peripherals. • 8MB 72pin SIMM memory module. • Amiga A600-compatible IDE controller.